Many clustering algorithms when the data are curves or functions have been recently proposed. However, the presence of contamination in the sample of curves can influence the performance of most of them. 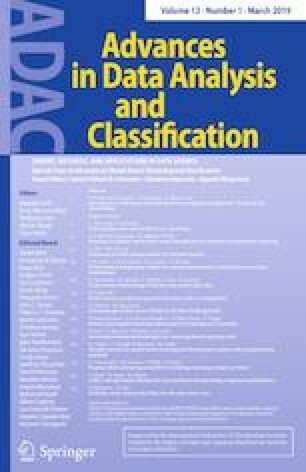 In this work we propose a robust, model-based clustering method that relies on an approximation to the “density function” for functional data. The robustness follows from the joint application of data-driven trimming, for reducing the effect of contaminated observations, and constraints on the variances, for avoiding spurious clusters in the solution. The algorithm is designed to perform clustering and outlier detection simultaneously by maximizing a trimmed “pseudo” likelihood. The proposed method has been evaluated and compared with other existing methods through a simulation study. Better performance for the proposed methodology is shown when a fraction of contaminating curves is added to a non-contaminated sample. Finally, an application to a real data set that has been previously considered in the literature is given. We would like to thank the Associate Editor and two anonymous reviewers for their helpful suggestions and comments. This work was partly done while DR and JO visited the Departamento de Estadística e I.O., Universidad de Valladolid, Spain, with support from Conacyt, Mexico (DR as visiting graduate student, JO by Projects 169175 Análisis Estadístico de Olas Marinas, Fase II y 234057 Análisis Espectral, Datos Funcionales y Aplicaciones), CIMAT, A.C. and the Universidad de Valladolid. Their hospitality and support is gratefully acknowledged. Research by LA G-E and A M-I was partially supported by the Spanish Ministerio de Economía y Competitividad, grant MTM2017-86061-C2-1-P, and by Consejería de Educación de la Junta de Castilla y León and FEDER, grant VA005P17.